It sounds as if Lightnin’ Hopkins is playing and singing in your room. It’s spooky. but the sound of blues-in-the-flesh - Tone Audio. Named a "Top Ten Vinyl Reissues of 2016" by The Absolute Sound! For this 1963 Prestige Bluesville release, Lightnin' Hopkins is paired with bassist Leonard Gaskin and drummmer Herb Lovelle, who not only offer up a very sympathetic backing for his bare bones signature guitar style and instinctual rhythms, but provide some essential muscle as well along the way.The solid 8-song set consists of all Hopkins originals and finds the blues legend in fine form throughout, never more so than on the cuts "Stranger Here" and "You Better Stop Her." Part of the ultimate audiophile Prestige stereo reissue series from Analogue Productions featuring 25 of the most collectible, rarest, most audiophile-sounding Rudy Van Gelder recordings ever made! All titles will be mastered from the original analog master tapes by Kevin Gray. Deep groove label pressings, tip-on jackets on thick cardboard stock. .
Sam “Lightnin’” Hopkins, a true poet who invented most of his lyrics on the spot and never seemed to run out of new ideas, was a blues giant of post-war blues whose style was rooted in pre-war Texas traditions. While he cranked up his amp to fierce proportions when performing for his friends at Houston juke joints, producers who recorded him for the so-called folk-blues market usually insisted that he use an acoustic guitar for more “authentic” results. Either way, Lightnin’ seldom made a bad record, and , who did a remarkable job of following his irregular bar patterns and abrupt song endings. 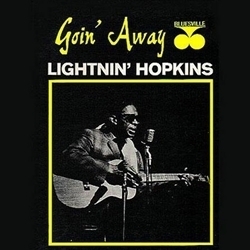 Recorded in 1963 for Prestige Bluesville, Lightnin’ Hopkins is backed by Leonard Gaskin (bass) and Herb Lovelle (drums), both straight Jazz musicians. Yet, this pairing results in an unpretentious sound that allows Lightnin’ Hopkins to do his thing. Part of the Fantasy reissue series, this AP pressing is dead quiet and the sonics are great. Hopkins slinky acoustic guitar playing is relayed with crisp detail. The songs on Goin Away are stripped-down to the most basic elements, allowing for the presence of the recording space to come through naturally. The dripping blues swagger of the title song will infect you. It sounds as if Lightnin’ Hopkins is playing and singing in your room. It’s spooky. but the sound of blues-in-the-flesh Tone Audio.